How are you tracking your fitness progress? Weight loss can be an important method in trying to live a healthier lifestyle. Oftentimes we use a bathroom scale to help us track how much weight we’re losing. But doesn’t it seem like that new diet or exercise you’ve been trying only helps you lose weight temporarily and sometimes you end up gaining even more weight? Doesn’t it feel like nothing is really working out the way you had expected? That’s because your bathroom scale is misleading. Your weight is made up of muscle, fat, and water. The key to effective weight loss is losing excess body fat, not overall body weight. Weight loss is not the same as fat loss. Instead of tracking how heavy you are, use body composition analysis to track how healthy you really are. Body composition analysis is key. Body composition analysis refers to measuring your body composition, generally known as your body muscle, fat, and water. Instead of focusing on a single number on your scale, body composition analysis allows you to focus on losing body fat and gaining muscle while retaining the proper amount of body water in specific areas of your body. Body composition analysis is the key to tracking and maintaining effective weight loss. Lose weight smarter, healthier, and happier like never before. Visceral Fat Level and more! Take your InBody Test every 2 to 4 weeks to continuously monitor and improve your weight loss. 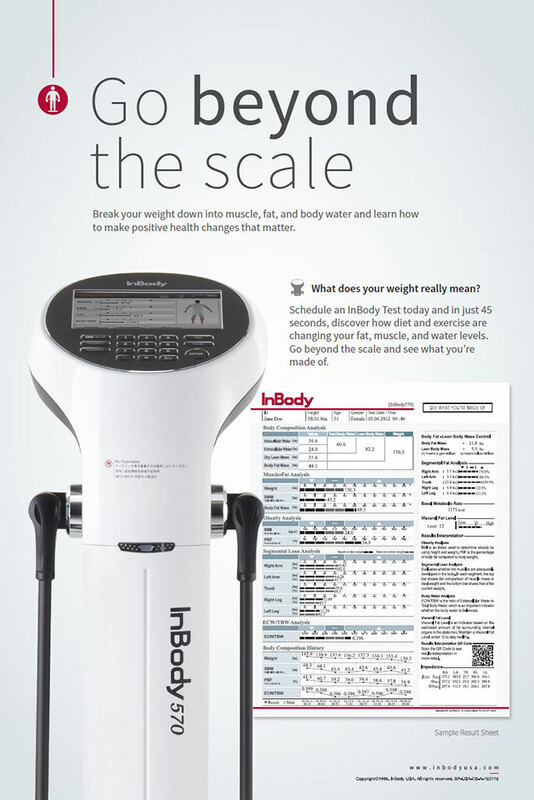 Receive a free consultation with every InBody 570 Test. See how body composition analysis can help you lose weight smarter and more effectively. To learn more about InBody devices, visit www.inbody.com.